Positioned centrally in the dockyard is ‘Boathouse 7’ which was our venue for lunch. The Boathouse had been used since the mid 1700’s for the building of small craft and boats for the Royal Navy. The Boathouse lunch was a great success and many pictures were taken during lunch. Have a look here for pictures. When deciding on both the venue and the programme for our Reunion, the committee wanted to ensure a truly memorable experience in a location with a strong historical and nautical heritage. A high priority was also to provide the opportunity for old friends to get together in a relaxed and informal atmosphere, unrestricted by the time and location constraints of just a formal dinner. We believe that the choice of Portsmouth fulfilled all this and more! 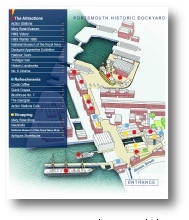 Don’t forget that the dockyard pass is valid for multiple visits for a full year. So if you are back that way you can pay a visit. 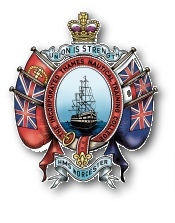 The Nelson Room at the Royal Maritime Club had been set aside for a display of items from the ship which, when the college closed, were put into store in the vaults of Chatham Historic Dockyard. Included in the display were silver trophies, paintings and pictures as well as many items being loaned by OWs. The display was manned by volunteer OWs during the opening times on Wednesday 20th and Thursday 21st and was kindly organised by Michael Wheeler who would be glad to hear from any members who feel they have something to say about the display and/or the future of the Worcester artefacts. Please see “Contacts” page for Michael Wheeler’s details. You certainly cannot accuse OWs of not turning up on time! By shortly after 3.00 PM Gunwharf Quay was awash with OWs and their guests eagerly awaiting the arrival of our three cruise vessels. The sun shone as we boarded and the weather remained fine for the harbour part of the cruise and, despite predictions, held off raining for the whole evening. The informal atmosphere and space on the vessels allowed members to freely circulate and meet up with old friends. Arriving back at Gunwarf Quays we were all greeted by the Royal British Legion’s Victory Band (RBLVB) playing a medley of nautical music. The formal concert started at 8.00 PM and its highlights included the participation of a squad of Portsmouth Sea Cadets in a re-enactment (in musical terms) of a day on board the ship. 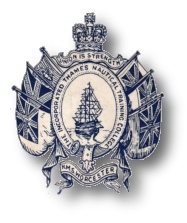 Sea Cadets marched on to ‘A Life on the Ocean Wave’ and Reveille, Colours, Pipe to Dinner, Sunset, Pipe Down and Last Post were all played together when appropriate with the sounding of the Worcester’s ships bell. Grey haired hardened ancient mariners were to be seen with tears of nostalgia in their eyes. Everyone present commented on the amazingly smart appearance and turnout of the sea cadets making us proud that they represented current British youngsters. Towards the end of the concert an eerie lament on the Highland Pipes rose in volume as Captain James Cole (52) entered playing ‘Cathedral’, firstly as a solo and then with the full RBLVB. Later OWs were erect, to attention and with their thumbs on the seams of their trousers as the National Anthem was played by the full band. Finally, as the concert came to an end, OWs and their guests drifted off to their boats, hotels and to fill the Quayside bars to reminisce with old friends.